Platypus Creations: New sock monkeys in the shop. Come and meet siblings, Indigo Berry & Rose Berry. They are kicking off 2017 together. You can buy them together or separately. They are available for $20 each plus postage (capped at $8 within Australia). 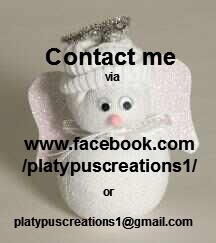 Pop over to my Facebook page if you would like to purchase one or both or send me an email. Address on right side of this page! 8..9..10 "Coming, ready or not!" I prefer to triple stitch the seams to help against ripping and I like to securely sew limbs etc on with heavy duty, quality thread. They will generally withstand some tugging, but not vicious abuse. They are made to be loved and to last. All Platypus Creations sock creations are totally hand crafted from brand new socks and are stuffed with 100% hyper-allergenic polyester filling in a nut, pet and smoke free environment. Please note: Some socks tend to pill or even fray a bit. Do not cut the threads or pull on them. They will not cause the monkey to fall apart. It is part of the natural wear. 50% of all sock creation sales will go to Without a Ribbon – an Australian rare cancer charity for all those rare cancers that are not recognized elsewhere.